For over 20 years our company has been involved in controlling pesky birds when and whenever they are causing major damage to Agricultural sites, Harbour areas, Marinas and Golf Courses. Chamber of Commerce's, Parks and Recreation Departments, Corporations and Private Managements are choosing and referring to us, to get a grip on those pesky intruders. We will trap intruding pigeons, no mess on your valuable equipment anymore! Note: There will be no killing, no shooting or any other noise involved! Are you interested to become a Falconer? Take a course at "Golden Creek Bird Farm"! 2. 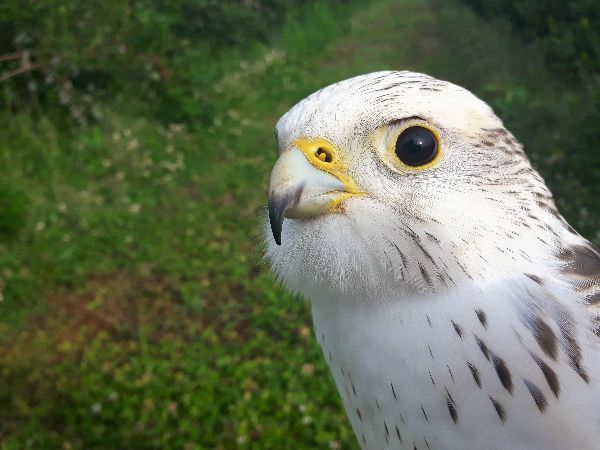 15 month long apprenticeship time with a "Sponsor" (us) to obtain your "General Falconry License" which allows you to keep a maximum of 3 "indigenous" birds in province of Ontario. 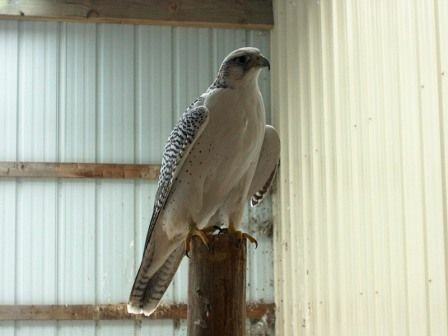 We will teach you how to handle and how to fly your raptor, housing, food, equipment and medical care (if needed). Course will be held every 1st Saturday each month from 1PM - 5PM. Courses are run in group sizes of approximately 6 - 10 apprentices. Breading and holding aviaries are constructed and adoptied very well to the size of the raptors and their maneuver - ability. Our records show that we are on the right track and we are a CITES registered breeding facility. We offer customers a fine line of unrelated breeding stock from various countries.